What is the Big Red and Blue Flag in Ybor City? From time to time, you will see a Red and Blue Battle Flag flying just below the American flag at the top of our building. 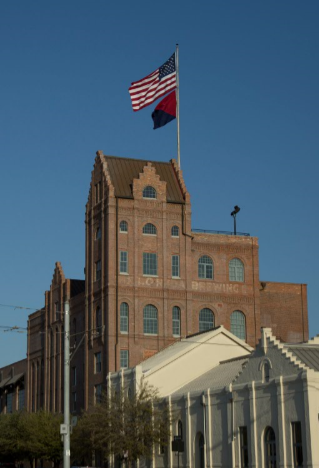 Our law firm resides in the Old Florida Brewing Company, the tallest building in Tampa’s Ybor City, always flying an American flag for everyone to see (weather permitting). On special occasions however, when our clients have made exceptional recoveries or won verdicts we proudly fly our Battle Flag as another symbol of the firm’s patriotism and commitment to our nation’s justice system and our clients. We are proud to be able to fly our Battle Flag, no matter it’s location. See more of our flag in the video below that highlights why Swope, Rodante P. A. was listed as one of the best places to work in 2013.